Like an island or a cloud? You are right – cumin is the star in a Punjabi tarka! I am very fond of this type of tarka for my dals – only rarely will I add garam masala to it. Any new cuisine is daunting but it is so great when you get to the stage where you can be intuitive with it! 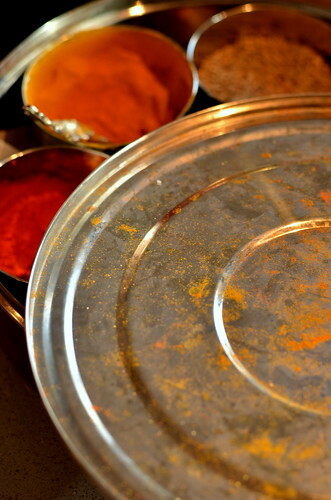 I look forward to seeing the ways you will use the garam masala! 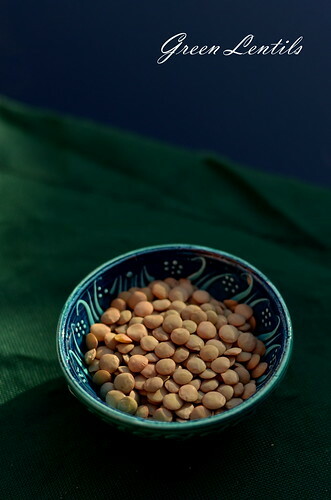 have you tried whole lentils in the slow cooker/crockpot? put the tarka and the lentils and everything else in the slow cooker overnight. Less work, more flavour. Of course you know that I would love this recipe. Shame you didn’t get a photo, as I am sure it was a gorgeous dish. Yum. Try some jaggery if you can get some instead of sugar. Has its own unique flavour. I am off to get my antique slow cooker out – it is SO old – and try bee’s suggestion for dinner tonight. ANITA, I really love the cumin tarka, too. Thanks for the garam masala recipe. It really smells amazing. BEE, No, I haven’t tried it. Thanks for the tip. Will do. Though I love fresh tarka both for its fresh flavours and visual effects. Will try to get a photo, I promise. GANGA, I will try to get some. I usually use brown sugar. Also, I have some lovely Mexican cane sugar which has a gorgeous warm, caramel flavour. A friend introduced me to it, and the idea of sprinkling it on some yoghurt. Simple, and divine. SOMA, I’m definitely at the love it end of the spectrum. My camera is in Sweden at the moment! 😦 The husband’s nicked it. We really ought to get a second one. That looks like one yummy dal, ok I am going to try it. I will pressure cook the dal though to make it cook fast. Do you have a pressure cooker ? Amen–relaxation is really the key to successful cooking of any kind. Having said that, all those Indian spices can be a bit daunting when they’re all lined up in a row! I made this yesterday, the easy way though but it sure tasted great. Didn’t even add the garam masala, cooked the dal with salt, turmeric, ginger, garlic, tomato and chilli in pressure cooker. Then did the tarka of cumin, onion. SANDEEPA, You’re most welcome! Hey, I can’t believe I tempted you to made it! :))) I’m so glad you liked it. I’ll try your version, too. No, I don’t have a pressure cooker, though I’m half looking to buy one. The only thing stopping me is lack of space at the moment. Can you recommend a good one? I cook my lentils without salt now (I mean I add the salt at the end), and I notice that they cook much more quickly like this. ON-LINE PASTRY CHEF – It sure is! Not the least because it brings concentration and enjoyment. 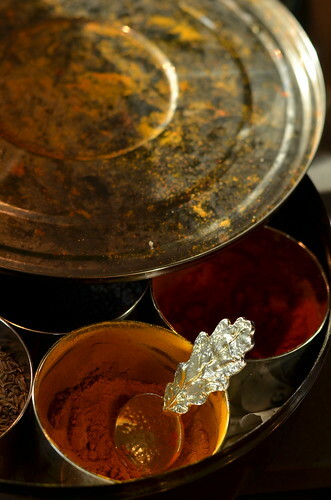 As for the spices, since I got to know them better, they’re not daunting anymore. Thanks, Talita! And welcome to my blog! pl show us some photos of it, would love to see how it turned out. bec we eat so much dahl at home, i try to be healthy and not do the tarka bit- i know it tastes very different as a result of that, but, one has to cut corners somewhere. my husb has been pestering me about putting up a post on dahl, but i am being really lazy about it…i know how to make it, as we eat it all the time, but i have never measured or timed it- what a pain! I’m sorry but I don’t have a camera at the moment, as our old one died on us a few months ago. I’ll post a photo as soon as I can, I promise. I’d love to see your dhal, so I’m joining in with your husband’s pleas. What’s in it? I adore dhals. honestly, not much-1 garlic clove, pinch turmeric, salt, chili pepper and tbsp or two of tomato sauce, just for colour. i mix two dahls- masoor and mung to get that velvety consistency. when i do do a tarka i do cumin, garlic slivers and my mother’s special addition- half a chopped tomato. LOTS of chopped cilantro/coriander for garnish. will try to put up a post soon. look forward to seeing your photos when you get a camera. Sounds good! And very healthy. I’d like to try the mung dhal – red lentil combo. I’m sure it’s great. 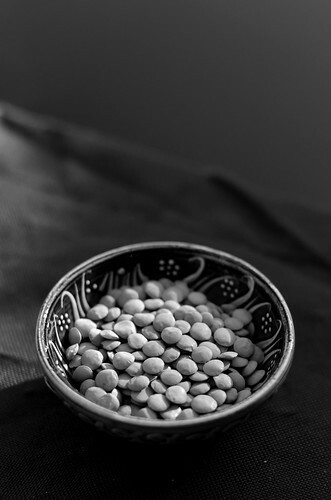 I’ve been making a channa dhal – mung dhal – red lentils dhal with coconut, and I love it. Which reminds me I should post that soon. I am going to make it soon, using a slow-cooker. However, I wanted to know whether I make the tarka separately, as indicated above, and then add it into the dahl in the slow-cooker, or do I put in all the ingredients at the same time, and allow time to mix in the flavours etc. Forgive me if the answer to my question should be self-explanatory. It will be the first time that I make dahl! Hi Helen, and welcome to my blog! Please make the tarka separately, and add it to the lentils at the very end. I’d also like to add that in this dhal, it’s important to brown the onions – until they’re nearly copper colour, but not burnt! Most dhals use tarka as a final flavouring. But, you could do what you said, and at the end, heat some oil/ghee, add a tsp of cumin seeds, wait for them tu splutter (10 s or so), and then add the garlic. Stir and remove from the heat so the garlic doesn’t burn. Add this to the lentils at the end, just before serving. You can even reserve a bit of the tarka and use it as a garnish/topping! Hope this helps. Let me know how it went! Maninas, I am going to make this soup, it sounds so delicious. I think I have all the ingredients at home, except the birds eye green chillies and Punjabi garam masala. I think I have to ask around see where I can find them. my mouth is watering! Love that cumin! Delicious! I highly recommend you try this recipe! I’ve tried a few different lentil and dal recipes, and so far this is my favorite! Thank you for sharing this. Thanks, Deanna, glad you like it! Do try the Bengali Red Dhal, too. It’s one of my faves! Yes after so many years living as a Sikh Punjabi man but in a different culture, I yearn to cook my own dishes the way Mom used to…your dish is very similar to the way she did it…especially the tarka…(I always thought that meant frying something separately as an addition to the main dish as in your recipe) we had simple fare like this with chappatis and another veg dish…meat or fish once in a while..and I guess the lentils are definitely a healthy diet. At 51, my hair is still thick and lustruous and my body is slim, although for the last 15 years I have not ate as I used to as a boy. I always try and get my kids to eat chappatis and dal, and they love it..my wife is not Indian. I also worked in a chappatti side shop(stall) as a boy in a Chinese coffeeshop in Singapore…one day I sat down to eat 7 chappatis with dal and some keema. The shop owner came by and counted the number of chappatis and was amazed that I could eat all that…hahaha. Just arrived home to a delicious smelling house! Looking forward to dinner tonight. Thanks for the recipe! Thanks for this delicious recipe. It was my first time cooking a dhal, but it definitely won’t be the last! Looks like a nice dahl recipe. Maybe if another type of dahl is added such as chana dahl it will be even better! oooh good idea! I’ve got lots of chana dhal so will try it with that only. Thanks for this… I’m making it right now! Could I ask, do you cover your lentils while simmering? I ask because my 2 cups of water have almost entirely evaporated within about 10 mins of cooking (simmering, no lid) and I’ve added at least one more cup to keep it going until the lentils soften. It smells amazing. I can’t wait for dinner! I do, yes. Simmering is low boil though, so should be ok in a medium pan (I’ll add the pan size to the recipe). It could be your cooker is stronger than mine, too, so the lentils are cooking more quickly. Hope you enjoy it! Let me know how it went. Thanks for the reply – I’ll cook them with the lid on next time, which should make a difference (it was on a very gentle simmer, so I don’t think it’s the heat). It’s a delicious dish!